Prime Spots In East Tennessee? First, I'm a New CAG member and new to the forum, and look forward to the conversations. I'm just asking, anybody know some especially good areas for carp? In particular in the Loudon county and Monroe county vicinity? Thanks. Aaron, there is Lenoir City Park on the west side of the lake just north of the dam. Across the dam is the Tellico Recreation area, I think that is the correct name. You can see both on Google Earth. That's how I found them. The Tellico boat ramp has a long sidewalk, large parking lot and restrooms. I'm the state chair and considering a fish-in up your way. Below Watts Bar Dam lock is where I caught my PB of 25-0! Keep in touch. Watch for the notice for some fish-ins this year. Waiting for the weather to clear up and the water flows to get back to normal. It already seems I been fishing a pretty prime area then! Caught lots at the Lenoir City Park, mainly around the "loop" near the wooden dock and the old boat ramp near where the present one is. Lots of smallmouth buffalo too. 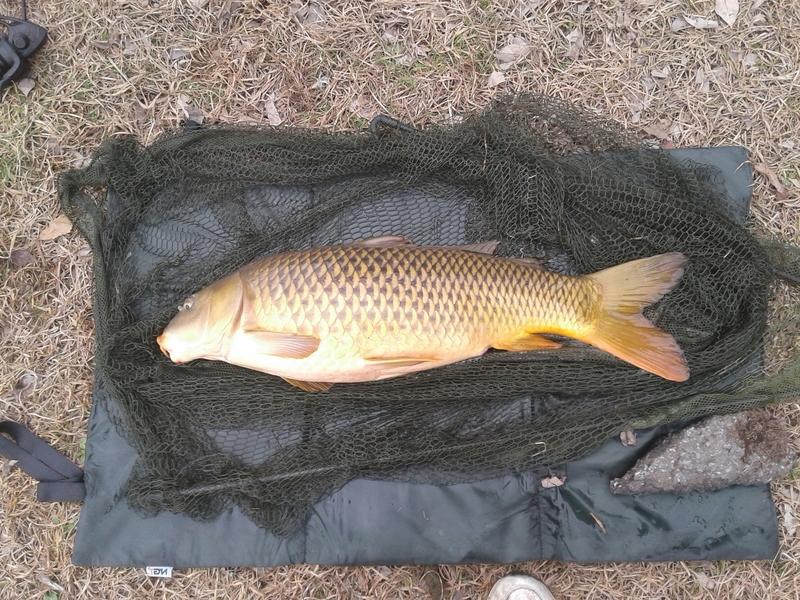 I also heard that they are large carp(30+ pounds) around Calhoun's in the Lenoir City marina, due to alot of people throwing bread out to the fish and ducks. Aaron, many thanks for your reply. That makes me feel good about having a fish-in there! I had visited there this past summer but really didn't see any place around Calhoun's where we could fish. Need to get back and look again. A while back, some folks fished by the restaurant (BTW, great BBQ) when the water was down. This was CAG's First fish Folly which is a fish-in open to all to see who can catch the first carp on January 1st of the new year. I am retired so I can come up during the week but let's keep in touch to meet there at the park and fish for a while. I would like to plan a fish-in for late spring. I have been in touch with the fellow who is with the park office and would need to give him a number of anglers to get his OK first. Might even set an appointment with him and explain what we are doing. Never hurts to have friends in high places. It actually was bigger than it looks in the photo. I sadly don't have those, I believe called Rueben-Heathon, scales or a carp weigh sling/sack yet, so I don't have the weight, but it felt around 15 pounds, give or take. R-H scales are a bit pricey for my budget. I bought a digital scale at one of the big box stores, brand is Field & Stream. It goes up to 50 lb. If I catch one that bottoms out, I'm calling TWRA to weigh it and see if it is a new state record which stands at 53 lb. I do have a sling and a tripod which can double as a single rod pod. My wife keeps asking when I'm going to get a cheap hobby. Welcome to the world of carp fishing in East Tennessee. We have so many prime waters, and so much uncharted areas to add to that. I certainly have slacked off in my angling over the years, but if I ever want to wet a line, there are a number of places I go to. I don't know that it has reopened yet or ever will, but the Ft Loudon dam, lock side was always a place to catch real numbers. Had some 30 + fish days of fish from 5 to 19lbs. Above Fort Loudon near the marina has yielded 1 20lber for myself and lots of others in the smaller range. Watts Bar dam on the lock side can fish great in the fall, but it takes some prebaiting to get the fish there. If you venture out to Knoxville, near the riverboat can bring good top water action. For pond fishing, Alcoa has a duck pond near the school that has produced over the years with decent sized fish for the body of water. Yes, access to the lock has been opened, but not as easy to get to now, as you have to turn off from hwy 321 onto a unpaved gravel road, and still alot of construction, thus the traffic is real bad at times, though the new bridge is open. A place I should mention that could have good carp fishing is the tailwaters below Melton Hill dam. Though I haven't fished for carp there, during the warmer months, at times when their not generating, I have seen alot of carp just below the surface, swimming in schools, some of them decent size. Could be a good topwater bite there. Melton Hill sounds like an opportunity for floating bread just under the surface or even a fly rod. Does the area have places to set up rod pods, etc.? I have some carpet yarn that floats like a cork. Need to try and tie something with it. I was below Center Hill Dam many years ago and there were lots of carp swimming around below the dam. So much water, so many carp and so little time! Aaron, looking forward to wetting a line with you and Brad this year. Looks like it's warming up so I need to get my carp gear sorted out and ready to go! Brad, writing a separate post in answer to your post yesterday. I had heard that the pond near the school had grassies. Anything to that? Yeah, there is a few places that you can set up a pod, such as a place you can find when you turn off of 321 onto the dam road, the one on the Lenoir City side, the Roane County side is really too steep. Note, if you decide to try on the bottom too, the area of the tailwaters closer to 321 has enormous amounts of tall weeds, forget the type, which will make bottom fishing a pain. Only the area right below the dam is largely weed-free, and there is a place to fish there. During a 2010 road trip, I wanted to fish at least one lake way up in northeast Tennessee. After studying the map, I selected Watauga Lake and I thought the dam area might hold some promising carpin sites. So, on July 5th, 2010, I headed for the Watauga Dam. It was not that easy to find but I finally got there. I was impressed with this lake; it’s nestled in a very picturesque environment with reasonably clear water. However, I decided to reject the dam area because of the long walk that would be required to get from the parking area to potential swims. I scouted the south side of the lake by taking US321 south out of Elizabethton. I found some Day Use areas that had some promise; the one I selected was the Watauga Point Recreational Area. The choice was easy because I ran into a North Carolina paylaker there who was hauling and who was planning to leave the next day. He had a boat and had baited the swim for two days with lots of cracked corn. We had a nice chat about carpin and I watched him haul with his paylaker equipment. I returned to that baited & productive swim the next day. I used gritspack, flavored maize on a hair with a 4 inch hooklink, and 1 oz of lead (slip and bolt both worked). I landed 25 fish in roughly 7 hours. The smallest was 4-0 and the largest was 13-0. There were 3 fish that exceeded 10 lb. The average weight was 6.6 lb. Watauga is a very scenic venue with lots of recreational possibilities. Plenty of carp too but it definitely does not appear (to me) to be a big carp water. The soil was reddish brown in the area so boat wake gave the shoreline water a reddish brown tinge. My swim would occasionally be visited by large numbers of butterflies. As with most of the Tennessee venues I visited, mosquitoes were no problem. Thats a nice carp and some beautiful photos of Watauga. Went there once a few years ago, but didn't get to fish it. Was going to fish the tailwaters for trout, but the weather soured the next day when I was actually going to fish. Beautiful lake though, but you're probably right about it not having much in the way of big carp. Its not very fertile of a lake at all, according to TVA. Its also rather cool, cool enough to support trout, including lake trout, and very deep. You probably already know this, but Lake Kefauver, off hwy 411 in Madisonville, has grass carp. Some good sized ones too. Tried for them, but no success. I wondered about that. That is in the Kefauver Park? Been by there many times on the way to Townsend and the national park. Need to get back up there and toss a few flies. So much water, so little time. Some toss bread wadded up on a hook for grassies and fished freeline. Keep trying! Love to see SWMBO get one! There are grass carp in the Alcoa pond. Large ones at that, but during the summer catching them can be iffy due to poor recovery post release. I have landed a few pushing 20lbs there, I have also lost 1 that I can confirm appeared over 30lbs, and another that never came close to being landed. I have also had a large grass carp from Kefauver before. I can't recall the exact weight, but it was my PB grass carp for a while. Dale, you mention clear water at Wautaga. Aren't carp supposed to muddy the water? Thanks for the report and the photos. Correction, the new Ft. Loudoun lock access road looks to be paved now.